Asian countries must now hedge against a new risk - of American withdrawal. Options are limited. For many years now, Asia's smaller and middle powers have pursued a policy of "hedging" against strategic uncertainty. The uncertainty they worried about was the possibility that Beijing, as its power grew, might try to replace the old US-led order in Asia with a new, more China-centred one. Their response was to engage China economically and politically, but at the same time to draw closer to the US strategically. They hoped this would bolster Washington's capacity and willingness to resist Beijing's strategic ambitions if they did indeed grow. Stronger links with the United States have been South-east Asia's - and Australia's - hedge against the possibility of a more threatening China. But now that policy has been overtaken by events - in two ways. First, the old uncertainty about China's ambitions has been dispelled. There is no longer any question about whether China might at some time in the future try to assert itself as the new strategic leader in Asia. It is already, and very clearly, doing just that. This can be seen not just in President Xi Jinping's words about a "new model of great power relations" and Asia's "shared destiny", but in his actions in the South China Sea. Second, as that old uncertainty disappears, a new one emerges - about what the US will do. Until now it has been possible to assume that if China becomes more assertive, then the US would be there to shield the smaller powers in Asia. That has become much less certain - especially under Mr Donald Trump. The depth of this uncertainty is quite plainly shown by the fate of the Trans-Pacific Partnership trade initiative. The TPP might never have been as important economically as its proponents believed, but there is no doubt that it was a critical test of the US' strategic resolve in Asia. That's because the Barack Obama administration, up to and including the President himself, made such a point of describing it as such. They warned Americans that failing to back the TPP would send an unmistakable signal that the US was not serious about contesting China's strategic challenge in Asia. Even so, the TPP was repudiated by both major parties' presidential nominees. What could be a plainer sign of America's declining commitment, even if Mrs Hillary Clinton had won the presidential election? Mr Trump's election only amplifies the message. So now the big question mark in Asia's strategic situation is not about China's ambition in the region but about the willingness of the US to resist it. That means the hedging policy needs to shift focus. We no longer need to hedge against the possibility of Chinese assertiveness, but against the uncertainty of US commitment. How can Asia's smaller and middle powers hedge against that? What alternatives are there to relying on the US? Not surprisingly, there are no ready or easy answers. American power and resolve has been the primary foundation of Asian security for so long that there are few ideas around about what the alternatives might be. One obvious option would be to simply accept that China will take the US' place and emerge as the region's primary force. But that would be quite risky. America has been a benign hegemon, and also a reassuringly distant one. China is more worrying because it is both less liberal and much closer. I doubt many countries in the region would be content to live under China's shadow if there was any practical alternative. A second alternative would be for smaller and middle powers to align themselves with another regional great power, like Japan or India, to counter-balance China's power and influence. That might be what Japanese Prime Minister Shinzo Abe would like to see if America's support for his country falters. He seems to envisage Japan leading a coalition of Asian countries to contain China's leadership ambitions. But that too holds real problems, because it risks drawing the other regional countries into Japan's bitter bilateral disputes with China. Asia's smaller and middle powers may worry about Chinese hegemony, but they still value relations with China and do not want to find themselves forced to choose between Tokyo and Beijing. The other countries might also wonder about Japan's support in any dispute they might have with China in which Japan's interests were not directly engaged. Could anyone be sure that Japan would risk a confrontation with China on another country's behalf? And the same doubts would apply to India. A third option would be to rely on Asean. At first glance this looks the best bet. As the region's primary multilateral grouping, it brings together almost all of Asia's smaller and middle powers, and has the capacity to draw in others such as Australia, New Zealand and South Korea. Moreover, it has a long-standing and robust commitment to key principles of international order which enshrine the kinds of protection that smaller and middle powers might seek from an over-powerful China. Alas, the problem for Asean in playing this role is that it is too big, and its membership is too dispersed geographically and too diverse in relations with and perceptions of China. We can see already that some members - Cambodia, Thailand and now the Philippines, for example - take different views of China from other members. Countries that border China directly, like Vietnam, will always take a different view of China from those like Indonesia, which is separated both by greater distances and open ocean. 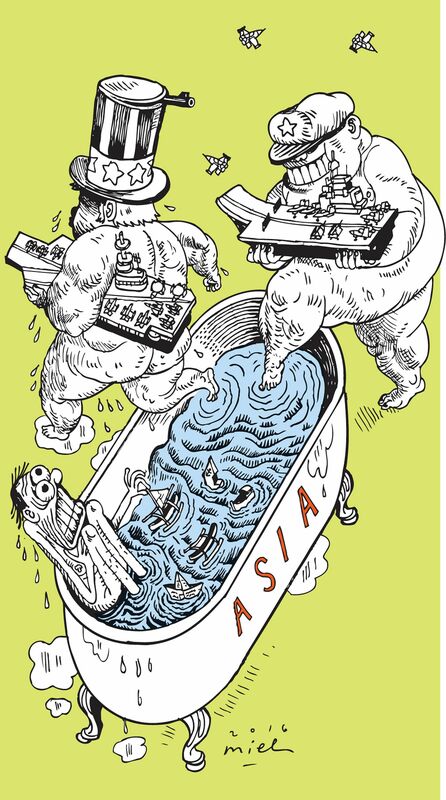 The reality is that these differences mean Asean will find it very hard to build and sustain a united position in relation to China, which limits its value as an alternative to American power as a way of deflecting Chinese hegemony. We are left then with only one credible option, which is far from ideal but may be the best available. That would be to focus on building a smaller grouping which is more compact geographically and with a more natural close alignment of interests than Asean can achieve. This grouping would include, at its core, Singapore, Malaysia, Indonesia, Australia and New Zealand, as well as the smaller states of the wider archipelago. These countries all share a maritime geographic environment. They all share clear interests in preventing any external great power acquiring too much influence over their part of the world. They have deep habits of cooperation stretching back decades in many different forums and institutions. And they have widely complementary strengths to bring to the partnership. It is far too early to think of drawing these countries into any kind of formal alliance, but it is not too early to start talking to one another, much more seriously than has been done so far, about the way challenges are emerging in Asia, and how we might best respond to them together. That is the prudent way to hedge against the new uncertainties the region faces in the age of Donald Trump. The writer is a professor of strategic studies at the Australian National University in Canberra.